This is the first comprehensive history of America's involvement in the Middle East, from George Washington to George W. Bush. From the first cannonballs fired by American warships at North African pirates to the conquest of Falluja by the Marines, and from the early American explorers who probed the sources of the Nile to the diplomats who strove for Arab-Israeli peace, the United States has been dramatically involved in the Middle East. For well over two centuries, American statesmen, merchants, and missionaries, both men and women, have had a profound impact on the shaping of this crucial region. Yet their story has never been told. Until now. Drawing on thousands of government documents and personal letters, this audiobook reconstructs the diverse and remarkable ways in which Americans have interacted with this alluring yet often hostile land stretching from Morocco to Iran and from the Persian Gulf to the Bosporus. Covering over 230 years of history, Power, Faith, and Fantasy is an indispensable work for anyone interested in understanding the roots of America's Middle East involvement today. ©2007 Michael B. Oren (P)2007 Tantor Media Inc. I thoroughly enjoyed this book. Oren explains the rich history of interactions that the United States (officially and through private citizens) has had with the people and governments of the middle east. His portrayal seems balanced and shows both the good will and the popular misperceptions of the region in the eyes of the people of the United States. The prologue tells an intriguing tale, but then the introduction mires down into a wretchedly tedious bibliography. If you can suffer through that part, it turns out to be an excellent historical work. Don't give up, but don't try to skip forward, because the second bookmark is Chapter two. So either miss the entire first chapter, or find something to do while the reader expounds on why the book needed to be written. I don't agree with the reviews criticizing the book as being tedious and repetitive. I didn't have any trouble following the jumps in time, and I found the details and links between people fascinating and informative. Sure, it's a little dry, but I did not lose interest in it at all. If you like detailed historical information, you will also find it fascinating. Based on the sample provided I thought I might be wasting my money because the narrative style didn't do much for me. After making it through the introduction and the very first chapter, the story became very engrossing and the narration very fitting for the subject matter. I've not listened to the full book yet, but I'm giving it 4 stars for several reasons.......the narration can make or break an audiobook for me, and I am pleasantly surprised in that area after about 10 hours of listening. Second, the book itself is very enlightening. I can't speak for the full book at this point, but so far its well worth the money and I'll probably pick up the book too. Don't get me wrong: The book itself is very interesting, full of information that fascinates and intrigues. I bought the book. The audiobook was tedious and boring. Since the book is pursuing three specific academic themes, examples are frequently retold and anecdotes either referenced or repeated as the author gets to each theme. In the interests of developing his three theses, the author breaks up the chronology in a way that can be very distracting and hard to follow when you are listening (without a way to quickly leaf forward or backwards as you might with pages). You will listen through a segment of history in one theme, only to have it start over again as the author pursues and develops his next thesis. This inevitably results in repetition and disconnects the precedents and antecedents throughout the history. All of this adds up to an audio experience that can become tedious and seems to make the book longer than it really is. Since it is an audio experience, one cannot easily skim through sections quickly, as we all learned to do with academic books in high school or college. You must listen to the whole thing or take your chances in skipping ahead. In the end, I went out and bought the book. It's a great book. It's not a great listen. This is an extraordinary story about the US's involvement in the Middle East. I never realized the extent of this involvement and how present day actions are a logical continuation of what we have been doing there for over 200 years. Scary. I learned so much from this book. But it wasn't enjoyable. It isn't particularly well organized. Perhaps it would be better to read it. Like many Americans, I have wondered a lot over the past few years about the United States' relationships with the nations and other entities of the Middle East. This book shed some important light for me on America's attitudes and actions toward the Middle East, showing that many of the issues we are dealing with today are related to events in our nation's earliest history. 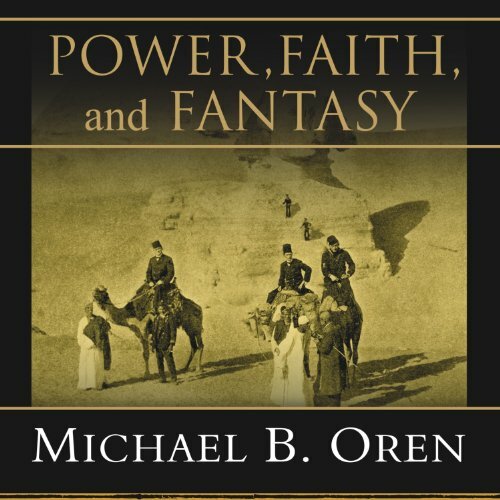 Oren doesn't do much to explain Middle Eastern points of view, but that is not the purpose of this book. He does a nice job with the themes of "power, faith, and fantasy," which are unifying without being overbearing. I enjoyed the narration of this book, and even though it is long I plan to listen to it again--it's that informative. If you think history is boring think again. Michael B. Oren is the best storyteller of history that has shaped Americas foreign policy. If you have no idea of our history with the Middle East this book tells it all. Norman Dietz keeps the reader engaged and on edge from the introduction to the conclusion. Its hard to believe that an account in history can be read with such excitement. What made the experience of listening to Power, Faith, and Fantasy the most enjoyable? Filled with so many personalized facts and personalities. Wonderfully told story of America's link to the Middle East. So many facts and history that never gets told in schools. I have a new appreciation for the complex relationship. Well done!